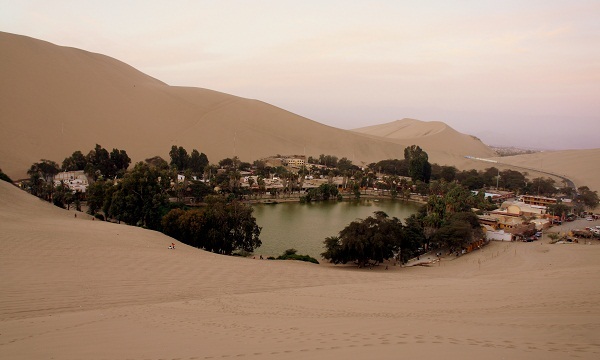 Huacachina (pronounced “wah – ka – chee – na”), Peru is like no place on earth. 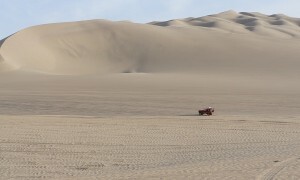 It is an oasis city surrounded by some of the world’s biggest sand dunes. We had a short 5 hour bus ride from Lima to Ica down the coast, Huacahina is a short, 5 minute taxi trip from Ica. Only pictures can do justice to this town. A lagoon is the centerpiece of the town, around it are hotels, restaurants and bars. And immediately behind are sand dunes. Huge, barren, sand dunes. It is like nothing I’ve ever seen before. I’ve seen plenty of sand dunes on a couple drive through Egypt, but nothing like this place. Once you walk out of the oasis, there is nothing. It is a proper desert, with only sand. No birds, lizards, or snakes; no trees, palms, or cacti; only mountains of sand for as far as the eye can see. In Huacachina everyone is doing one thing, sand-boarding! 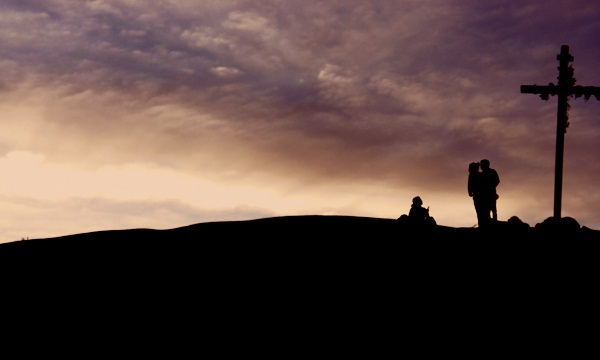 You strap a snowboard to your feet and surf down the sand dunes, and its awesome. We spent all day surfing and sliding. We even had a Peruvian family cheering us on. The sand dune we went on wasn’t too big, about the size of a sleding hill at home in Wisconsin (about 100 feet tall). In the afternoon we went on one of the craziest rides of our lives. 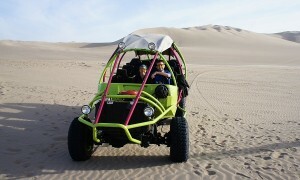 A huge sandbuggie with a big V-8 and a crazy man at the wheel drove us up and down the dunes. From the second we took off into the desert, we knew we were going to be in for a treat. 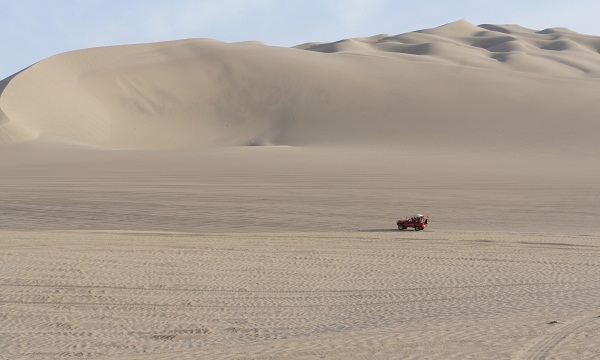 The engine roared as we flew up the dunes, and then we’d stop at the top, just long enough to realize how high we were how steep the drop, then we’d zip down the dune, identical to a roller coaster, everyone screamed, our stomaches dropped and we had the time of our lives. The dune buggy stopped at the top of a large dune and the driver said “now its time to sandboard” he handed us a board and we were off. The first dune was only 150 feet tall, and not too steep, so I surfed down standing up. It was fast, wreckless, and a ton of fun. There isn’t much steering on the board, its mostly just point and shoot from the top of the dune. The next 3 dunes each got progressively larger until about 200 feet. Then we reached the final dune, easily 300 feet tall, and insanely steep. By this time we’d evolved our riding style from seated, like in a sled, to face first. It’s one of those things were you just keep trying to push the limits for a bigger thrill. We started with a group of 8 but by the time we reached the final sand mountain 2 people had wiped out pretty bad and decided not to board anymore. I’m sure the one lady ate a pound of sand when her board flipped. So there were 6 of us left, and at the top of the 300 foot sand mountain everyone was a little hesitant to go first. So I jumped on my board, face first, and took off down the mountain. It was insane. the sand flew up behind me, I kept my legs up in the air for more speed, the ride was fast and smooth. Smooth until about half way down, then I hit a bump, caught a little air, and landed in some more bumpy terrain. I held on for dear life, let out a couple screams and glided to a safe stop. I was quickly followed by Leah and the rest of the group. We drove around in the dune buggy for another 30 minutes, before making it back to town. 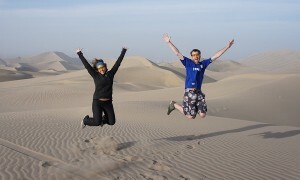 I highly recommend sand boarding, its like sledding, just in the warm sun. Huacachina was a nice escape from the hustle and bustle of metropolitan Lima, and a great introduction to our much anticipated beach trips.